Clive Campbell, aka Kool DJ Herc and the father of hip-hop, came to New York from Jamaica in 1967. Toting the seeds of reggae from his homeland, he is credited with being the first DJ to use two turntables and identical copies of the same record to create his jams. But it was his extension of the breaks in these songs – the musical section where the percussive beats were most aggressive – that allowed him to create and name a culture of break boys and break girls who laid it down when the breaks came up. 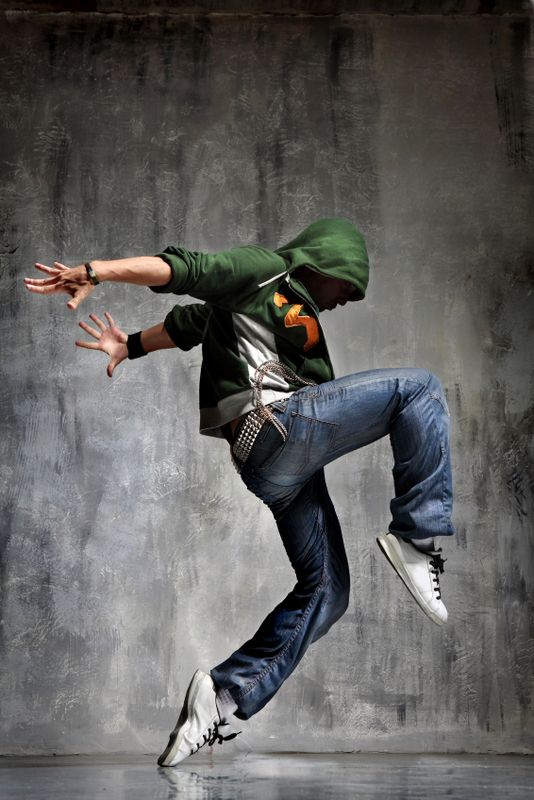 Briefly termed b-boys and b-girls, these dancers founded breakdancing, which is now a cornerstone of hip-hop dance. True revolutionaries in their own right, the b-boys and b-girls of the east coast helped lay the groundwork for hip-hop as a formidable dance force. Top rockin’ was one of their designs, marked by moves performed upright. Necessity became the mother of invention and with more competitive dance wars floor rocking was created. Earth-bound freezes and spins found their footing in this form of expression. Even the physical transition between top rockin’ and floor rocking – the drop – became an important repertoire embellishment, with the smoothest swipes and dips garnering the most props. Flashier moves developed including the windmill and flare which fall under the umbrella term, power moves. Perfecting these moves became the focus of the most skilled breakdancers. New York gave birth to another hip-hop dance form, one arguably created by b-boys, Rubber Band and Apache. Brooklyn uprocking, simply known as uprocking, is considered to be the inspiration for top rockin’. It is an overtly competitive style of dance where individuals or lines of dancers, also known as Apache Lines, display their arsenal of superior moves in a battle for badness in the best way. Jerking, an abrupt yet rhythmic motion, became the trademark of this dance form which is also characterized by quick moves and humorous retaliations. Many dancing teams, such as the Rock Steady Crew and Dynamic Rockers, reached notoriety in this form. On the other side of the country new dance moves were developing: Popping, a west coast invention, was arguably sponsored by Boogaloo Sam and the Electronic Boogaloo Lockers. Popping is done by contracting the muscles in time with the music and is most always performed while standing up to make use of strong angles. Some argue that this dance phenomenon was not created by Boogaloo Sam but descended from preexisting dances. Others claim it is a product of dance revolutions happening across the country at this time while still others consider it to be the first true hip-hop dance, one leading to the invention of other moves like the boogaloo, strut, tick and wave. A popular semantic and physical companion to popping is locking or Campbellocking, another California concoction. Ushered in by Don Campbell, his signature move is characterized by briefly freezing the joints in tight conjunction with the beats, accented by moving the limbs liberally. Campbell formed a group called “The Lockers,” spreading funky moves including scooby doos and points across the US. While developed as separate funk-driven moves, both popping and locking eventually found sanctuary in the arms of hip-hop. They cannot, however, be credited as the only west coast hip-hop inventions. Different regions of California were known for their indigenous interpretations of hip-hop dance. The above forms and moves, while diverse, can all be categorized as street dances. Street dances are defined as those moves created outside of the dance studio, moves prone to the spontaneity and improvisation of the individuals and crews that have made hip-hop the inspired force that it is today. Studio-taught hip-hop has been criticized from this end, sometimes considered too stifling an environment to cultivate the individual character that has been so key to its progress and development. On the other end, there has been concern that the early forms of hip-hop dance have been so diluted through personal expression that they are no longer being taught or performed correctly. To combat this, purists suggest the teaching of hip-hop moves in their earliest, most untainted forms. This controversy is evidence of the current creativity swelling around hip-hop dance. Platforms like krumping and clowning provide stages for new school hip-hop. Expressing darker emotions like angst and aggression, krumping, not to be confused with krunking, is a confrontational form of expression utilizing dramatic and exaggerated moves. Dances falling into this category may appear violent, but in reality are a positive release of a negative force. Clowning is a closely related dance form with marked differences; while current versions may be following the more aggressive trend of krumping, clowning is essentially characterized by dissing, joking and jeers. The blurry surface of hip-hop dance is a difficult one to dip below, from the numerous conflicting time lines, the onset of this movement floats between the late ‘60s to early ‘70s. With dancers across the country being moved by the beats of Kool DJ Herc and his colleagues, it is hard to confine credit to more than a handful of inspired dancers. With the assistance of expressive minds searching for a way to further their skills through physical feats, hip-hop will continue to grow as more steps are taken to look into its past and forward as the continual creation of moves propel its evolution.